This recipe for Mediterranean Salmon Foil Packets with Lentils is a quick, healthy and tasty 30 minute meal. Best of all, can be baked or grilled with summer veggies and protein-packed lentils. These are perfect for busy summer nights, camping and cookouts. Plus recipe video. Thanks to USA Pulses and Pulse Canada for sponsoring this post. As always all opinions are 100% my own. Summer is all about light and simple meals and you can’t beat how easy foil packet dinners are. They are all the rage right now since they take hardly any effort to throw together. The best part though? 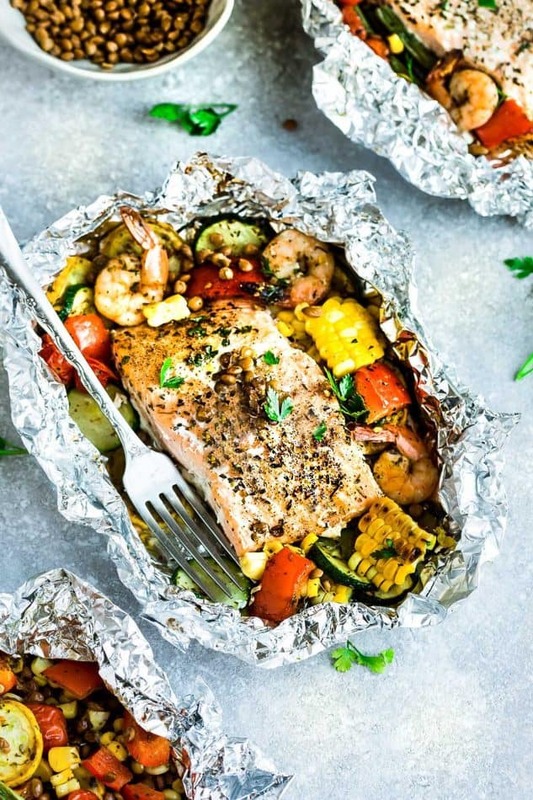 Clean-up is a breeze with virtually no pans to scrub and no dishes to wash.
Foil packets are tasty all year round and they’re especially convenient during the summer when you’re camping or grilling in the backyard. Plus, they are easy to customize with whatever veggies you have on hand. 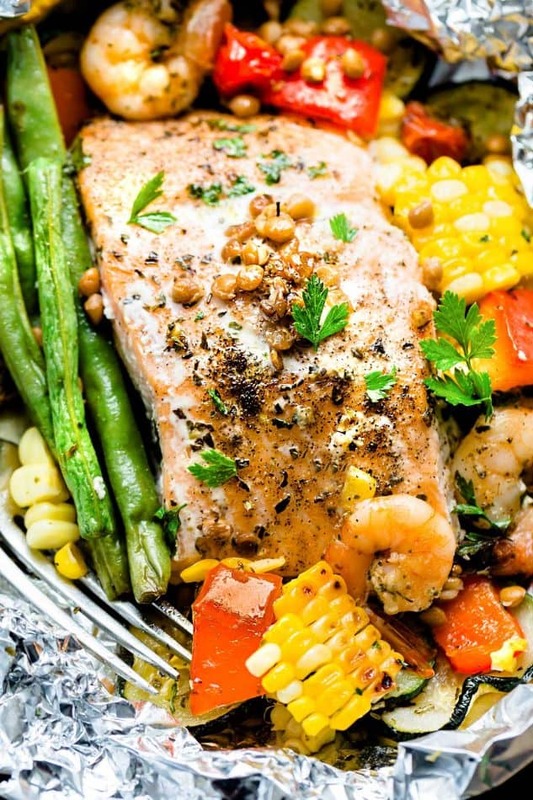 These Mediterranean Salmon Foil Packets are one of our favorite healthy meals for busy weeknights. 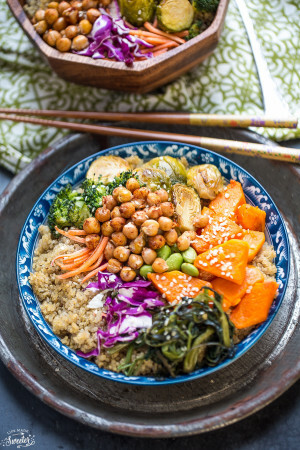 They are fresh, flavorful and loaded with fiber and tons of protein from the additional cup of pulses I added. Are you guys on the pulses train yet? You can find pulses everywhere these days. They are known as dry peas, chickpeas, lentils and beans. My kids are big fans and I love incorporating them into our meals whenever I can. They’re hearty, low in fat and high in protein, fiber, vitamins, as well as minerals which will help you feel full longer. 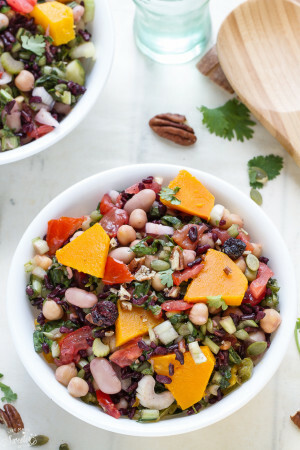 Adding a 1/2 cup serving of pulses into your diet 3x per week is so easy! 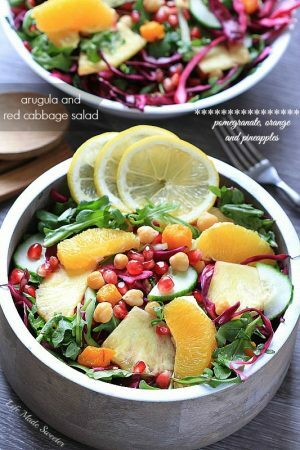 You can sign up for the 4 week challenge by heading over to Half-Cup Habit, and check out all of the recipes. In a large mixing bowl, combine the lentils, vegetables and shrimp with olive oil, sea salt, black pepper and dried herbs. Arrange evenly around the salmon then wrap tightly in foil. You can toss the foil packets on the grill while you’re camping or cook them in the oven on a busy weeknight. 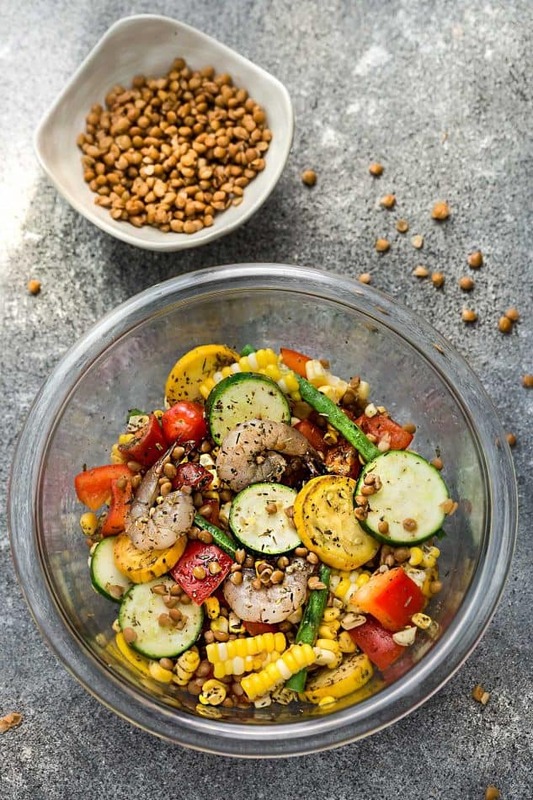 This recipe makes a healthy all-in-one meal infused with tasty herbs and flavors that just scream summer. This recipe for Mediterranean Salmon Foil Packets with Lentils is a quick, healthy and tasty 30 minute meal. Best of all, can be baked or grilled with summer veggies and protein-packed lentils. These are perfect for busy summer nights, camping and cookouts. 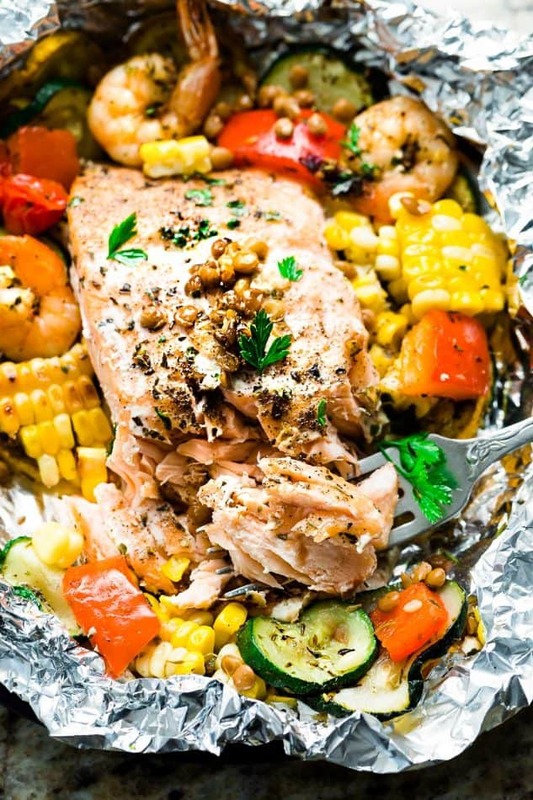 Place one salmon in the middle of each piece of foil. Season with salt and pepper and drizzle with 1 tablespoon of olive oil. In a large bowl, combine the lentils, vegetables, shrimp with garlic, olive oil, salt, pepper and dried herbs. Toss to coat then divide evenly into each foil packet, arranging them around the salmon. Top salmon with 1 or 2 tomato halves rubbing some seasoning on the salmon. Fold the foil bringing all sides together and close off the packets. 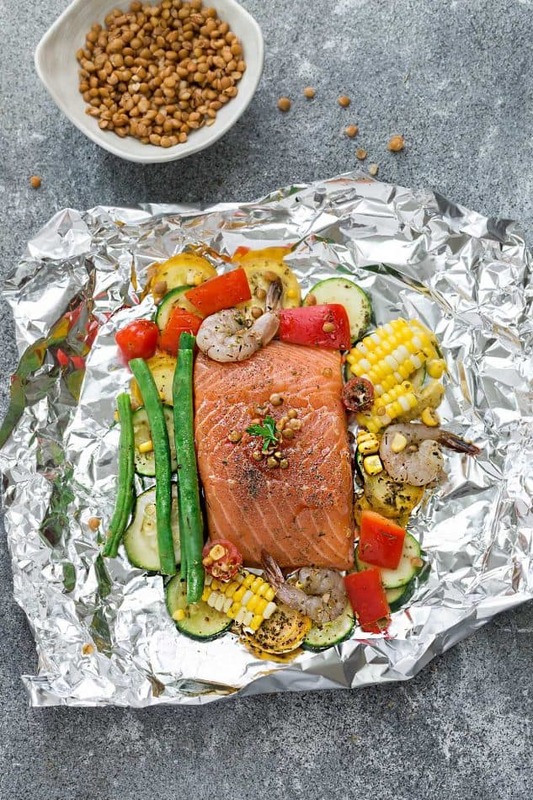 If cooking on the grill: Place foil packets onto grill and grill for 6 minutes, then flip over and grill for an additional 4-6 minutes (depending on the thickness of the salmon) or until salmon is flaky and shrimp is opaque and pink. 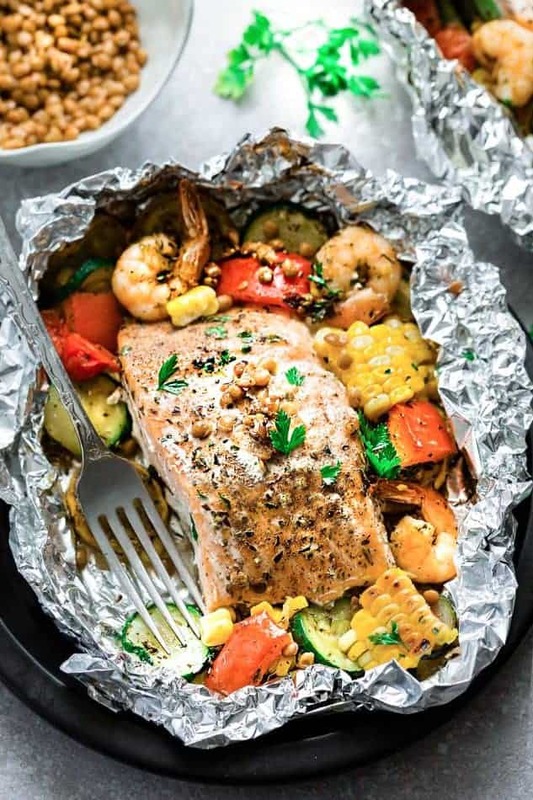 If cooking in the oven: Place foil packets on a baking sheet and cook for 15-20 minutes (rotating tray once) or until salmon is flaky and shrimp is opaque and pink. Time varies depending on the thickness of the salmon. Remove baking sheet from oven. Carefully open packets. Serve warm with a splash of lemon and top with chopped parsley.